Adaptation and mitigation are jargon words in the political and policy world of climate change. They reflect two very different approaches to the problem of what to do about climate change effects. Climate change adaptation is all about coping. Adaptation actions are designed to absorb or resist the impact of whatever comes along in the way of global warming effects. They are about protecting ourselves and our economies from drought, sea level rise, severe weather and numerous other effects by whatever means we can. Adaptations can be direct such as the construction of sea defenses to protect coastal areas from rising sea levels. Or they can be indirect, such as land management tactics for minimum tillage and enhanced vegetation cover that reduces the impact of drought on agricultural production. Indirect actions also include policy options such as tightening planning restrictions for low-lying areas around coasts. Investment in adaptation sends the message that climate change effects are inevitable. And rather than avoid them we should do our best to make our natural and economic systems resilient to the impacts. Philosophically this is a passive stance of acceptance. The water will rise so it best to move to higher ground rather than stand in the same spot and get your feet wet. In the western world such passive policy is not popular. This is partly because it sends a defeatist message and partly because it costs money with no immediate upside. It is a bit like insurance, useful when there is a disaster, but a hoot if you take the risk and avoid paying the premiums. As there are many among us who still do not believe there is any climate change risk, why should we have to pay the premiums. Mitigation assumes that climate change effects can be reduced or even eliminated. In policy terms it is all about actions that will limit or reduce the rate of global warming. And if the right actions are taken then climate change can be brought under control and any effects eliminated or much reduced. In other words mitigation assumes we can prevent global warming impacts and follows the more positive premise that prevention is better than cure. Mitigation is mostly about reducing carbon intensive activities [emission reduction] particularly from energy production and transport that that use fossil fuels. Mitigation is also possible in land management where clearing of native vegetation accounts for over 12% of global greenhouse gas emissions. Policy that reduces rates of vegetation clearing would be a mitigation action. Needless to say mitigation is much more popular politically than adaptation even for those who believe climate change is real risk to human societies. It suggests that humans can fix the problem ourselves. We can take actions that will engineer our way into 'no climate change'. Observant readers will have picked up that mitigation also makes the assumption that climate change is all about greenhouse gas emissions. And if emission reduction is achieved then climate change will stop, or at least slow. This is a big call considering there are many other causes of climate change from variation in the solar wind to shifts in the Earth’s orbit. Adaptation and mitigation | Is it an either/or? If it were a choice between adaptation and mitigation, then, so far, the policy choice is for mitigation. The preference has been for market mechanisms that use carbon dioxide as a commodity. If an action results in lower carbon emissions and the amount of CO2e can be accounted accurately then those emission reductions can be claimed and traded as a commodity. 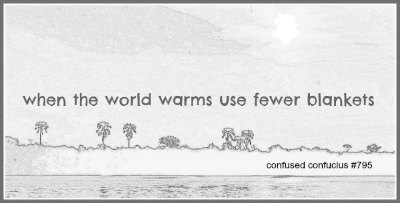 Do enough emission reduction and the problem of global warming will go away. The benefit of adaptation comes from risk management and a buffering of any future global warming impact. Adaptation actions accrue a future benefit, not a current one. This can be difficult to justify in our instant gratification world. Adaptation actions tend to have an upfront cost [raising the sea wall] without an immediate commodity benefit [the wall is only needed when the sea level rises significantly]. Except that there really isn’t a choice. We will need adaptation because many of the climate change effects are already upon us or have been set in motion. we need to transition away from fossil fuels anyway before they run out. In the end though, adaptation and mitigation are both essential. It cannot be an either/or. We can't take the risk that mitigation will actually reduce climate change and we can't let the already significant climate change effects disrupt our wellbeing. We need the each way bet. there is an interesting conundrum in adaptation and mitigation. Adaptation is not really about climate change at all. It is about producing food and fibre for 7 billion souls when those people and their immediate predecessors have already drastically altered the landscape and the ability of natural capital to provide the necessary goods and services. We simply have to be more adaptive than we have ever been. Paterson, J. S., Araújo, M. B., Berry, P. M., Piper, J. M., & Rounsevell, M. D. A. (2008). Mitigation, adaptation, and the threat to biodiversity. Conservation Biology. Tol, R. S. J. (2005). Adaptation and mitigation: Trade-offs in substance and methods. Environmental Science and Policy, 8(6), 572–578. Usually the links go to the websites of the publishers of this material. In some cases it is possible to find out more by entering the title of the paper into Google Scholar. Confused Confucius spurned the monastic life for the world of work, moral conundrums and mobile devices. His sayings and incongruous idioms on the environment and modern life bring delight and bafflement in equal measure... check out more sayings here.